About time the year 2013 brought about some impressive US quality cinema other than anything with Matthew McConaughey, but here it is. 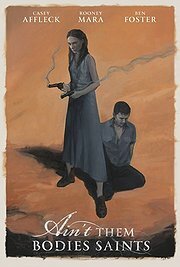 Bringing somehow together the best independent US movies can provide (even though I’m not even sure this counts as an indy), “Ain’t Them Bodies Saint” reminded me of milestones as old as “Bonny and Clyde”, as new as “Winter’s Bone”, with the “Assassination of Jesse James…” reference thrown in for good measure and for Casey Affleck’s sake (and I was reminded of the Terrence Mallick links by Christy Lemire’s review … very true actually). Affleck’s eerily high-pitched and always somehow tortured voice provides the atmospheric backbone of this drama about a good-for-nothing who still seems to be a good person and loving partner. As it needs to be, the world wants to keep him from doing the one thing he seeks, which is to be reunited with his girls – and in a very calm but very dedicated way, he works his way towards them after getting out of prison. This is not a thriller about hide-and-seek, about escape from prison or about cheating the headhunters. It is doing all those things in a slow, meditative fashion, letting me feel the approach, allowing to savour the desperation of likely failure, never questioning that Affleck’s character is exactly doing the right thing, even though it’s completely wrong and doomed. There is never any doubt about where this is going, but the doomed nature of his quest, and him pursuing it knowingly, makes this a love story with guns rather than a western with a love story, with excellent cast throughout (apart from Affleck and his love interest Rooney Mara, honourable mention to Ben Foster as love-struck local sherriff and Keith Carradine as shop owner with double agenda). And in another reminder of “Jesse James”, it is the soundtrack by Daniel Hart, which allows the film to push the story to the background, lays out a carpet of atmosphere on which the characters can tread with soft steps, floating towards each other and then apart again. The music turns the whole film into something like a piece of video art, reminding me (again, seems the film is also about conjuring memories of other films and stories) of how I felt when seeing Jarmusch’s “Dead Man”.